John Jackson "just felt like ridin"
On March 7th John Jackson packed up his Catrike Expedition and left his home in West Sacramento. because he "just felt like ridin". He headed to the Pacific Coast and then headed South along the coast and eventually made a left turn and is currently in Texas. 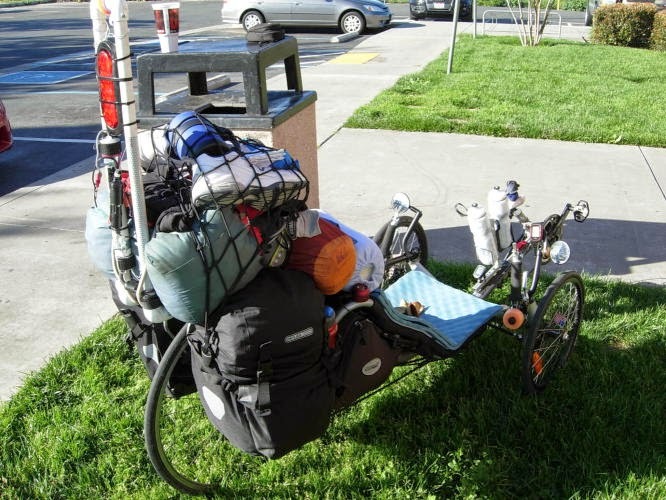 Click here for his "Nova Trike and The Flying Scrotchy" journal on Crazy Guy On a Bike (CGOAB). Check it out, it's a good read filled with pictures. John's Catrike Expedition loaded and reading to go. I'm on board with a couple of raffle tickets. I took the Expedition out today without Betzi to get some climbing in. The low gears on the Expedition are better for climbing hills while still breaking in the new hips. Slow and steady was the plan for the day. I'm good with moderate hills but I found out that the steep grades, no matter how short, are still not a good idea for right now. I forgot how much fun it is to ride the he Expedition without the added weight of a trailer and a dog. In the past almost every one of my rides on the Expedition has been with Betzi in tow. Without her extra weight the Expedition can really move. A stop at the park for a lunch break. I took the family up to Cambria for a little beach time on the Central Coast. I left the trikes at home to give the new hips a break from pedaling. Leili pointing out my 4 foot cairn that failed shortly. Back at the Cambria Pines Lodge, Byron and Leili. My daily 6:30 (in the morning) tea on the beach. Riding my trike is as much fun as being a 7 year old playing in a park. Actually it may be more fun judging by the way kids eyes seem to pop out when I ride by. Picture taken late last year while on one of my rides. Check out the bikes and trike being raffled off by Jacquie Schlitter. Click here for the all info. 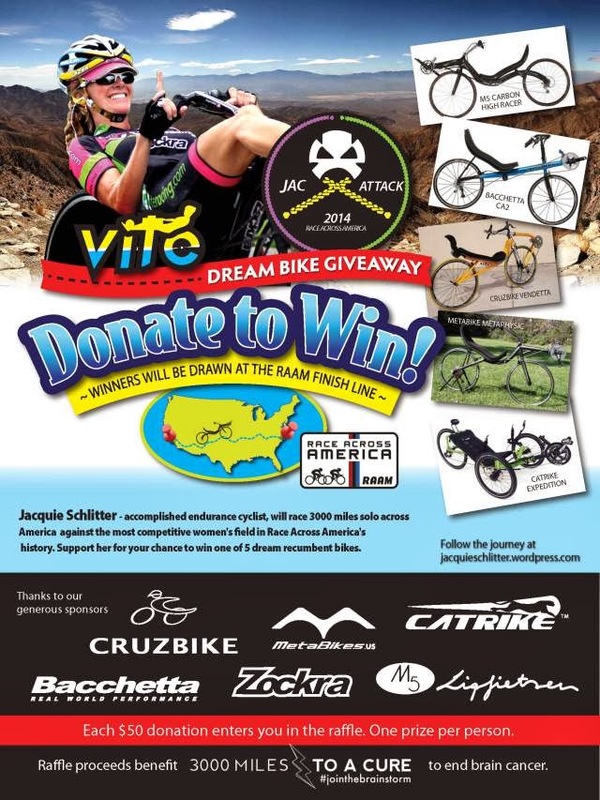 An interview with Jacquie Schlitter about her upcoming race in the RAAM. Click here to go to Jacquie's blog and listen to the interview. Her interview starts at minute 7. I went to the doctor today for a post op visit. Everything is good. It's been six months since my right hip replacement and three since the left one was replaced. Now I need to spend the next few months working out the stiffness (and soreness especially after a ride) caused by scar tissue. I'm told that scar tissue is a good thing. Muscle and tendon are soft and stretch while scar tissue is tough and holds things in place well. Photos from today's visit to the doctors office. Why Do You Ride That Thing? Over time I've developed a generic answer to the often asked question "Why do you ride that thing?". It's fun, fast and safe. And it's easy on my sixty old bones. It's fun, fast and safe. And it's easy on my sixty year old bones. Can you deny it looks like fun? And contrary to what you may think it is fast. It paces differently then a traditional bicycle but overall I keep up with (usually pass) anyone of the same fitness level as myself. The only way I could be a little faster is laid back on two wheels. Yes it is safe and drivers do see me. I look unusual and get more respect while then a traditional bicycle while on the road. Also on three wheels there is no wobble factor while keeping balance especially at slow speeds. Example; do you notice what usually happens when an average cyclist on two wheels turns his or her head to look at something? The bike follows the direction the head is turned. Finally, at high speeds a good trike is rock solid. I personally would not be comfortable on a bike at some of the speeds I reach on a trike. As for the old bones, riding a traditional bike is very uncomfortable. Would you deny me the joy of cycling because I'm different (maybe smarter) and I'm not willing to put up with riding a traditional bike with a seat stuck up my .... just to fit in? 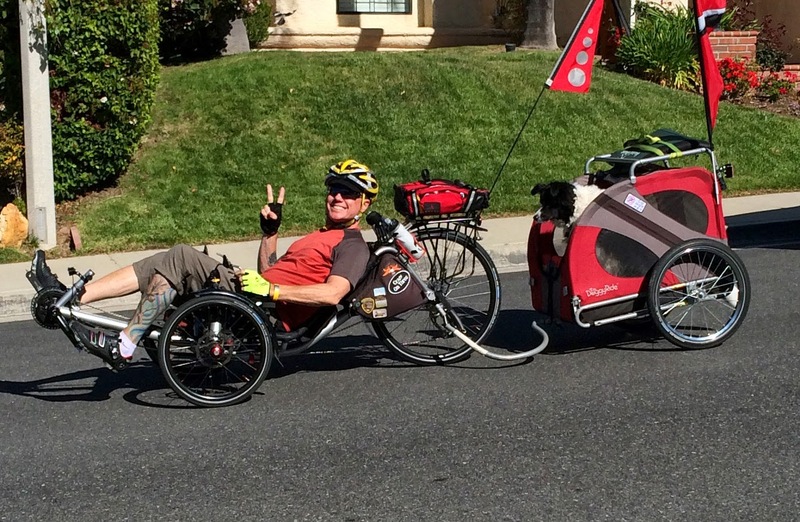 Here take my card and checkout for yourself what recumbent cycling is all about. 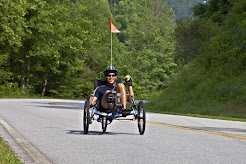 Check the link on my blog about the "The history of recumbent cycling" to get a better perspective of recumbent cycling. Yep, and that's the long answer more or less. Of course when I'm riding the Expedition and towing Betzi I have to explain what I mean "fast" and show a picture of my 700. 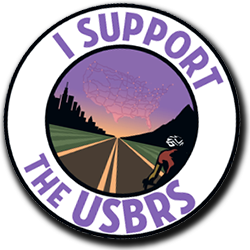 Regardless of what we choose to ride we're all cyclists. Our choice of what to ride should not be limited by the expectations of others. I ride my Catrikes because they're right for the way I like to ride. Catrikes are solid trikes that I have 100% confidence in whether I'm cruising around town or flying down a hill at 50 plus miles per hour. Additionally Catrike's customer service is second to none. Catrikes are fun, fast, safe. and very comfortable! My Expedition getting some upgrades. It's time that I treat my Expedition with the same respect I've given to my 700. The Expedition has served me well for five years but the 700 has received all the upgrades. On the Expedtion I recently went from a 9 speed cassette and chain to a 10 speed cassette and chain to get the lower gear a little lower. I thought that I could get by with the existing 9 speed Shimano Dura Ace 7700 bar end shift levers since I have always had them set on friction rather then the 9 speed index setting (to call the Dura Ace 7700 an "indexed" shift lever is a joke, their indexing is terrible). With the extra cog on the cassette (giving me ten gears on the back end) the friction shifting has made shifting pretty sloppy. The indexed shifting on my 700 is solid with it's SRAM TT 500 shift levers. I decided that the Expedition was deserving of the same quality shift levers. Now the Expedition has the SRAM TT 500s. Along with the shift levers I upgraded to a 10 speed SRAM X9 Type 2 rear derailleur. While in upgrade mode I upgraded the brake levers on the Expedition from Avid FR-5 levers to the Avid Speed Dial 7 levers (the same as on my 700). I like the ability to adjust the action of the brake lever. With a little help from my REI dividends both my Catrike 700 and Catrike Expedition share some of the same quality components making for a smooth riding transition between Cats. Other then a few laps around a school parking lot back in February the last time I took ma doggie Betzi on a ride was September 19th of 2013. I had my first hip replaced September 31, 2013 and the second hip replaced December 23, 2013. Finally it was time to test the new hips with Betzi in tow. 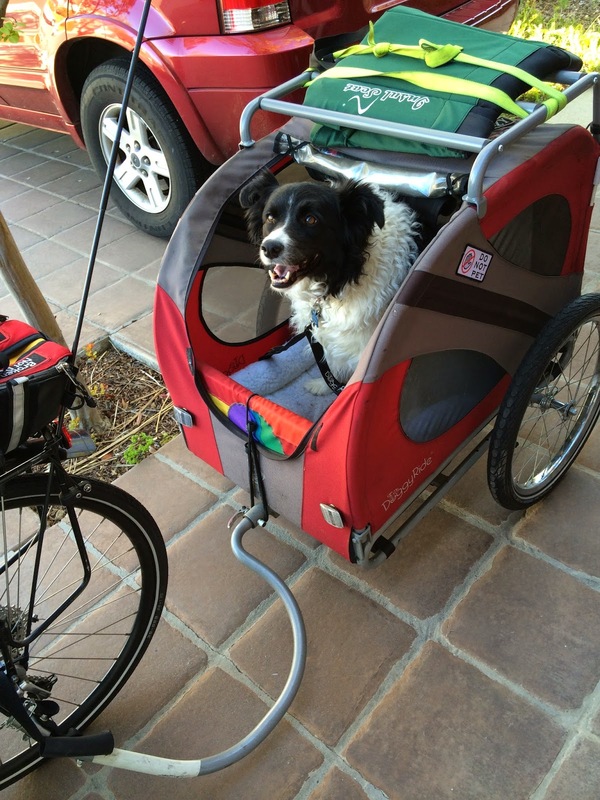 I hooked up the Doggyride trailer to my Catrike Expedition and hit the road with a slow 8 mile (503 feet of gain) ride. I was not anxious to tow 100 plus pounds of dog and trailer with my new hips but all went well. I'll be doing more rides with the ole girl. My Catrike 700 in front of the LEED Platium certified Hilton Foundation building in Agoura Hills. 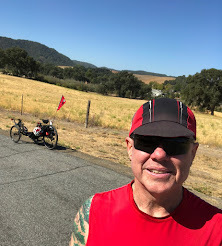 Rocketman took a break from TransAm Bike Race prep to tour the "left Coast". 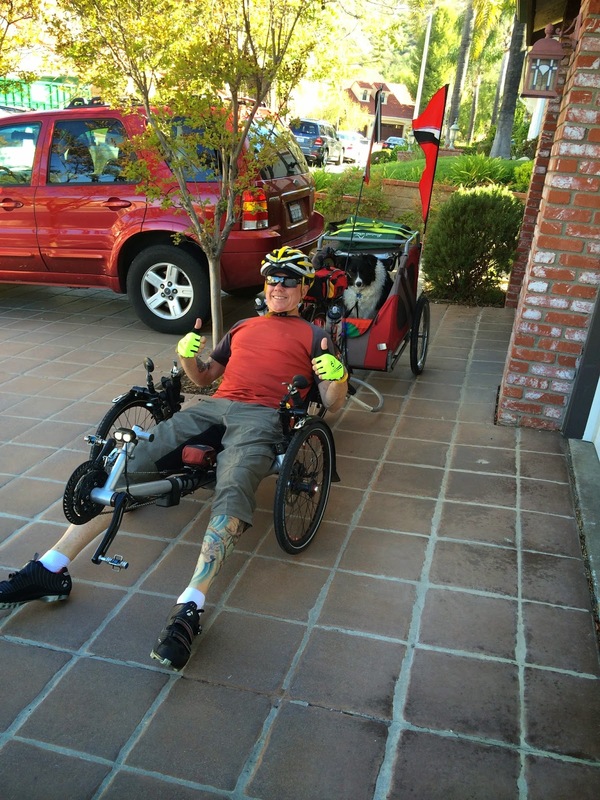 See the post here on his TransAm with Rocketman blog. 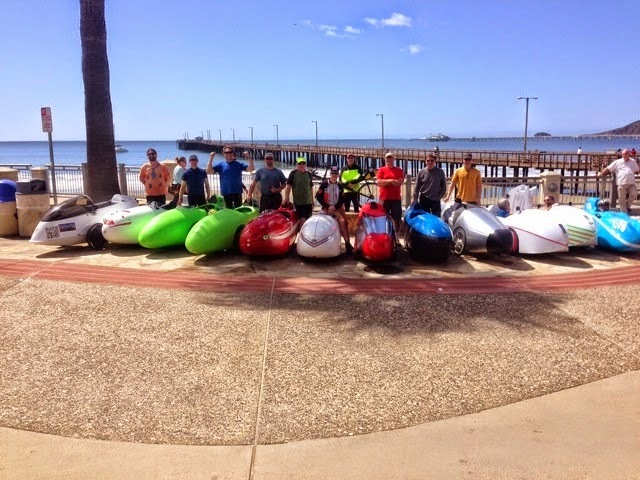 And here is the official Left Coast Velomobile Gathering website. Velos at Cayucos Beach, one of my favorites stops along the Central Coast. 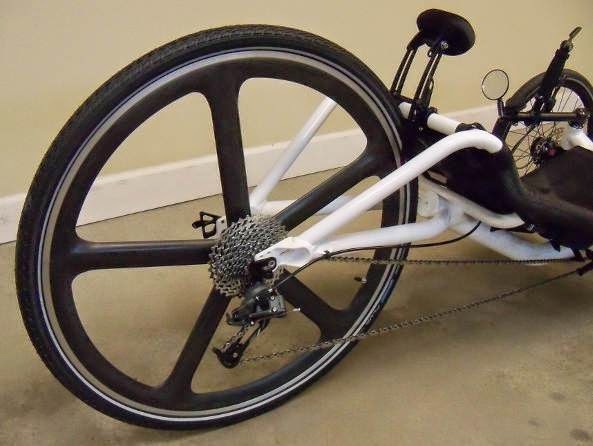 Steve, your trik'n host at the "Trike Asylum", is tweaking out his new Catrike 700. Read his updates here. Steve includes plenty of details.